The Swimathon is a nationwide swimming challenge encouraging swimmers across the UK to take part in a variety of challenges in a bid to raise money for charitable causes. It was established in 1986 and since then has raise over £38 million. 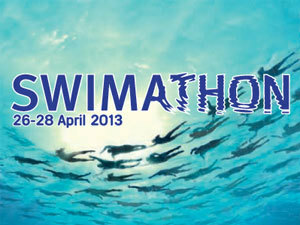 This year's Swimathon takes place between the 26th and the 28th of April, and includes three individual and team Distance Challenges, in which you have a choice of swimming 1.5km, 2.5km, or 5km. All the money raised will go to Marie Curie Cancer Care. There are 645 pools hosting the Swimathon, but even if one of them is not near you, you can still take part, by swimming at your local pool. All you have to do is get people to sponsor you and swim as many lengths as you can. Your total and time will then be put on the leader board, so you have something to boast about. Usually the price to enter is £11 for individuals or £25 for teams, but if you register in January, you will get 50% off.